What are risk factors for contact dermatitis? What are contact dermatitis symptoms and signs? How is contact dermatitis diagnosed? What is the treatment for contact dermatitis? What is the prognosis of contact dermatitis? Can contact dermatitis be prevented? Dr. Cole is board certified in dermatology. He obtained his BA degree in bacteriology, his MA degree in microbiology, and his MD at the University of California, Los Angeles. He trained in dermatology at the University of Oregon, where he completed his residency. Contact dermatitis is a rash that occurs at the site of exposure to a substance capable of producing an allegic or irritant skin response. Contact dermatitis can be caused by noxious, irritating substances or substances to which the patient has developed a skin allergy. Patients with contact dermatitis complain of itching and burning at the site of a red, elevated, crusty, weepy, scaly rash. Contact dermatitis is diagnosed by its clinical appearance associated with a compatible history from the patient. Confirmation of allergic contact dermatitis may require a skin challenge with the suspected substance. In addition, other eczematous eruptions must be considered and rejected. Contact dermatitis generally requires treatment with topical steroid creams, but if extensive, may require taking steroids orally. The prognosis is good if the provoking substance can be identified and avoided. Prevention involves avoiding skin contact of irritating and allergenic substances. Contact dermatitis is a rash that occurs at the site of exposure to a substance that inflames the skin. There are two forms of contact dermatitis. Irritant contact dermatitis occurs at the site of application of toxic chemical or substance which is directly noxious to skin. The second, allergic contact dermatitis, is an itchy rash that occurs only in people who have developed an allergic sensitivity to that particular chemical or substance. Such substances are not necessarily irritating or toxic although they may be. They are capable of inducing an immune response in the skin at the site where the direct contact occurs. This requires at least one previous contact in the past with that substance to allow the immune system to be primed to react to that substance when it is encountered again. Contact dermatitis is caused by the direct application of the inciting substance to unprotected skin. Therefore, the key risk factor is exposure to that substance. Contact dermatitis appears as a weepy, oozy, red, elevated rash (an eczematous eruption) at the site of direct contact with the inciting substance. The major complaint of most patients is itching or burning at that site. Older lesions are itchy but may only appear as red, elevated, and scaly. 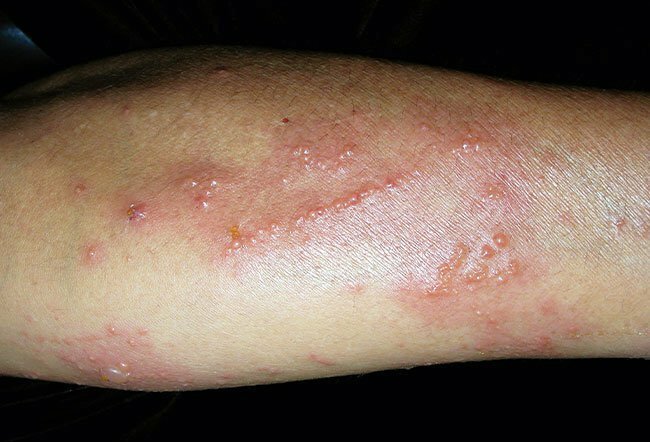 Irritant contact dermatitis is diagnosed by its clinical appearance associated with appropriate historical clues furnished by the patient during the medical interview. The incubation period between exposure and the onset of symptoms is minutes to hours so that the patient usually is aware of the identity of the causal substance. Allergic contact dermatitis is much more difficult to diagnose. The pattern of the distribution of the dermatitis is frequently helpful. For example, allergic contact dermatitis to poison oak, poison ivy, or poison sumac (Toxicodendron plants) typically appears as a linear eruption because the affected skin moves past the leaves of the plant in a line, distributing the allergenic material linearly. The induction of sensitivity requires at least one previous exposure. However, for mildly allergenic substances, many exposures may be necessary before an allergy is manifest. To correctly identify a particular allergen, it may be necessary to use a challenge technique called "patch testing" to confirm which substance is the cause. This requires at least a 48-hour application of the potential allergen to the skin under an occlusive covering. The development of eczema at the test site within two to five days after removal of the occlusive material confirms the presence of allergy to that substance. Other eczematous eruptions need to be excluded. This may require culturing for microorganisms, an evaluation of skin scrapings and scale, and perhaps a microscopic examination of a small piece of affected skin removed surgically for biopsy. Acute contact dermatitis is treated topically with evaporative measures. These measures include the application of repeated cycles of cool water compresses followed by drying. Once the weeping and oozing have stopped, then one can apply potent topical steroids two times a day to the affected areas for two to three weeks. Such medications are prescribed by a physician. If the area of involvement is too extensive to make topical treatment practical, it may be necessary to treat with oral steroids for two to three weeks. It will usually take one to three weeks for the allergen to be entirely removed from the skin so that the rash resolves entirely. If it is possible to avoid contact with the inciting substance, then the prognosis is extremely good. If the cause of contact dermatitis is not discovered and avoided, then it is likely that it will recur upon the next exposure. In the case of allergic contact dermatitis, there is as yet no reliable technique to "desensitize" the immune system of allergic patients, so avoidance is the only alternative. Avoidance is prevention for both allergic contact dermatitis and irritant contact dermatitis. On the other hand, there are certain precautions that can be taken to prevent exposure to either irritants or potent allergens. Protective clothing can be quite helpful. There are certain so-called "barrier creams" that may be more or less useful in limiting contact to irritants and possibly allergens. In the case of poison ivy, oak, or sumac, application of barrier creams has been shown to be of use prior to exposure (Stokogard, Hollister Moisture Barrier, and Hydropel are brand names of somewhat effective creams) when available. Dever, Tara T., Walters, Michelle, and Jacob, Sharon. "Contact Dermatitis in Military Personnel." Dermatitis 22.6 Nov./Dec. 2011: 313-319. View an Illustration of Eczema and learn more about Skin Problems and Treatments. A red, itchy, weepy reaction where the skin has come into contact with a substance that the immune system recognizes as foreign. See a picture of Allergic Contact Dermatitis and learn more about the health topic. An allergy refers to a misguided reaction by our immune system in response to bodily contact with certain foreign substances. When these allergens come in contact with the body, it causes the immune system to develop an allergic reaction in people who are allergic to it. It is estimated that 50 million North Americans are affected by allergic conditions. The parts of the body that are prone to react to allergies include the eyes, nose, lungs, skin, and stomach. Common allergic disorders include hay fever, asthma, allergic eyes, allergic eczema, hives, and allergic shock. Itching can be a common problem. Itches can be localized or generalized. There are many causes of itching to include: infection (jock itch, vaginal itch), disease (hyperthyroidism, liver or kidney), reactions to drugs, and skin infestations (pubic or body lice). Treatment for itching varies depending on the cause of the itch. Poison ivy, oak, and sumac contain a substance called urushiol, which causes a rash on people who come in contact with them. Symptoms and signs include a red, swollen, itchy, blistering, bumpy rash. Treatment involves rinsing the exposed area with water, taking antihistamines and over-the-counter pain medications, using topical treatments such as calamine lotion, and applying cool compresses. Drug interactions, and pregnancy and breastfeeding safety information should be reviewed prior to using this drug. Prednisolone (Flo-Pred, Pediapred, Orapred, Orapred ODT) is a corticosteroid prescribed to achieve prompt suppression of inflammation due to inflammatory and allergic conditions (for example, rheumatoid arthritis, lupus, gout, ulcerative colitis, Crohn's disease, hay fever, types of dermatitis, and many others. Side effects, drug interactions, dosage, storage, and pregnancy safety information should be reviewed prior to taking this medication. Dandruff (seborrhea) is a skin disorder that results from neither too much moisture nor too much oil. Dandruff can be treated with shampoos that contain tar, salicylic acid, zinc, selenium sulfide, or ketoconazole.